Welcome to Crystalworks, Canada’s finest mineral gallery! December 1st is the opening day of our annual holiday sale. 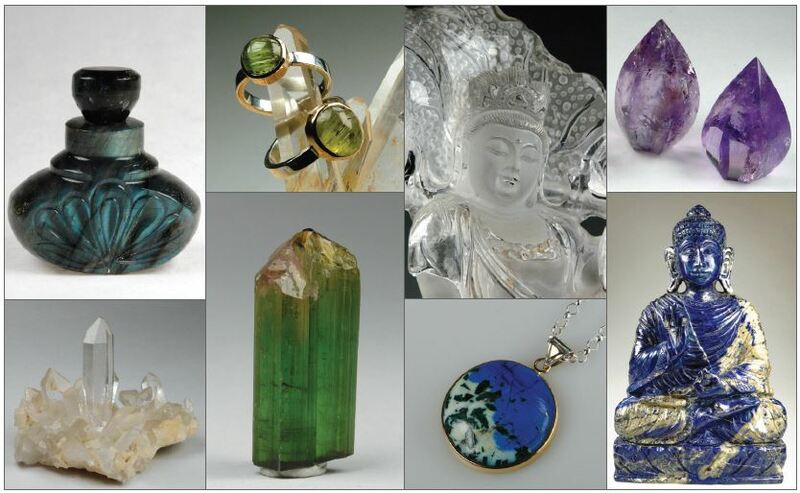 Up to 40% off our crystals, minerals, jewelry, gem carvings, fossils and stones. We celebrate it with a party from 1pm till 8pm. We’ll have lots of goodies, mulled cider, door prizes and gifts. In the spirit of this giving season we thought we would share this heartwarming story with you. A few years ago we decided to commission 200 palm sized rose quartz hearts to gift to people who are going through trauma i.e. enduring chemotherapy, grieving the loss of a loved one, or being a care giver and helping others in need. We approached our dear friend Elka who runs a fair trade lapidary factory in Madagascar and asked her if she could produce them and told her about our intent to give them away. About six months later, we met with her and she presented them to us. We were delighted with the beautiful quality of the rose quartz and the perfect comforting size for holding in the hand. When we went to pay her, she refused to accept any money. We couldn’t believe it! What a totally generous thing to do. 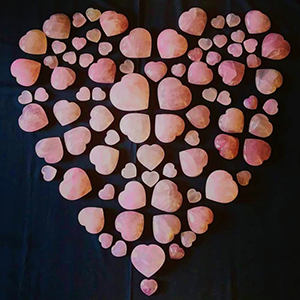 We believe that this act of generosity and reciprocity empowers the rose quartz hearts even more. So when we give one away we always tell the heartwarming story of their origin. Each and every object, from the smallest tumbled stone to the largest specimen, is hand selected by the owners for its beauty and perfection. Crystalworks’ mandate is to sell only ethically mined minerals. We do not sell dyed, man made or radiated crystals, or cave formations such as calcite stalactites or stalagmites. We have enjoyed close friendships with our miners and mineral dealers for over 32 years. This allows us access to rare and unique specimens which normally would disappear into private collections and never make it onto the open market. We also work closely with local and international jewellers, gem carvers and designers, providing them with select gemstones and crystals and co-designing pieces to create the jewellery, objet d’art and high quality gem carvings that are unique to the gallery. Crystalworks also supports cottage industries and fair trade companies in Bali, Peru, Madagascar, Indonesia and India. With the new space, it was our goal to create a modern, tranquil and healthy “green” environment in which to explore the beauty and creativity of our Earth. To this end, the gallery was outfitted with renewable resource bamboo millwork, innovative recycled material countertops, revolutionary LED lighting, low VOC paints, energy smart appliances, and finishes and furniture in sustainable materials. The floor of the gallery is infused with chlorite to help clear and ground the intense energies within the store. We are a closely knit family, both related and chosen, that is inspired by the mineral kingdom. We are passionate about what we do and we love sharing it with others. Opening this new gallery space has allowed us the opportunity to showcase the enormous creativity and beauty that our planet has to offer.